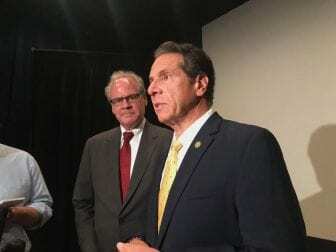 SYRACUSE, NY (WRVO) – The Cuomo Administration said will continue its economic development strategy, despite recent criminal convictions connected to some upstate projects, and an uptick in criticism about the policies. Cuomo said the state has run 9,000 economic development projects under his watch, many meant to reverse upstate New York’s economic malaise. But the strategy of pumping state money into projects has come under fire, especially after two high profile court cases ended recently with bribery and bid rigging convictionsconnected to upstate projects. Despite the drumbeat, Cuomo said the projects have put the upstate economy on an upswing, and he says Albany has made changes, taking many of these projects out of the purview of the SUNY Polytechnic Institute. So the strategy of pumping millions of dollars into individual projects, including construction of facilities for private business partners, will continue, according to EDC Chairman Howard Zemsky. He said the strategy has worked, pointing specifically to nanotechnology success in Albany.